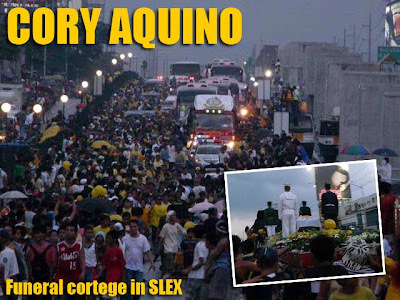 The nation came out in the thousands to say farewell to Cory Aquino last August 5. And we were there! 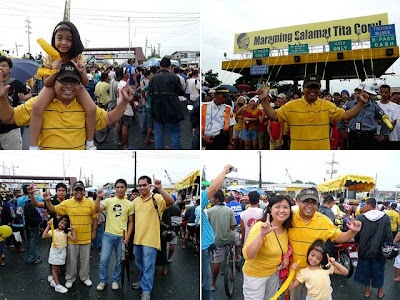 We waited that day for several hours, together with the throng of people, for the funeral cortege of Cory Aquino to pass by Sucat. The atmosphere was so electric! The nation was in total euphoria. I could not prevent my tears from flowing as I saw the cortege, not because I was sad that Cory passed away; but because I was happy Cory united the Philippine nation even in death. It took over eight hours for the cortege to complete the 22-kilometer route from the Manila Cathedral to Manila Memorial Park. By the time it arrived in Sucat, it was already dark. I am proud to have been part of Philippine history. 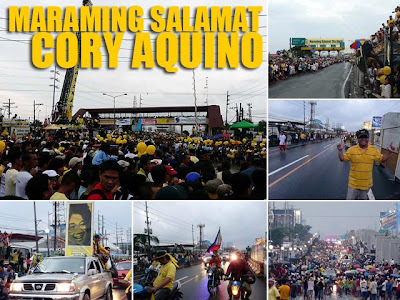 Maraming salamat Cory Aquino! Above is the billboard at the Sucat Exit which was installed by ActivAsia as its farewell to Cory. ActivAsia manages the North Philippines Visitors Bureau and the billboard advertising in the SLEX among others. i only saw it on the net. i wish i was there to witness history and say goodbye to Tita Cory. despite the weather the people turned out in droves to give her a wonderful send-off. let us hope that the people will be vigilant to ask for a better government. i miss her already. the country will certainly miss her moral compass. it is up to all of us now to continue what she started and ask for an honest and transparent government. This may be off topic but if you are close to the Aquinos,kindly tell them not to demolish their house in Times St. 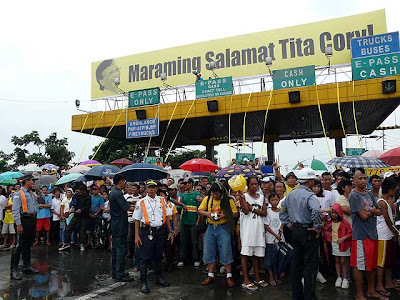 It is now a shrine, and also reminder to the people of the true characters of Sen.Ninoy and President Cory Aquino.Nakakalungkot if they will demolish it. It is like sacrilege. Yes.That is what Kris said in her interview.They plan to construct a new house.Sayang talaga.I have read the same sentiment in other sites.Please Mr.Henares,if you can let the Aquinos know how other people feel about their plan to demolish the house of our great late great president. I think they are planning to renovate it. Not sure if it will be torn down. Yeah, that's what I remember hearing din. Hope it's preserved since it's already historical. Thanks! Thank you Mr.Aquino and Mr.Henares.I really hope and pray that it is presereved. In her interview today,Kris said they will no longer demolish their house in Times St.Thank you to the Aquinos,and to this site too!